Before getting to today's recipe, just wanted to let any of my readers in Florida or the Caribbean know that my thoughts are with you and your families. And if you know of any local charities doing good work down there, especially in the Caribbean, please let me know in the comments. Because thoughts and prayers are great, but what's needed more is action (and $$$)! Even though it feels like fall right now, I know it's just temporary because of Irma, and living in a city nicknamed the armpit of the South, I can expect 80-90 degree temps well into October. So we're not breaking out the pumpkin here on The Joy of Eating just yet. 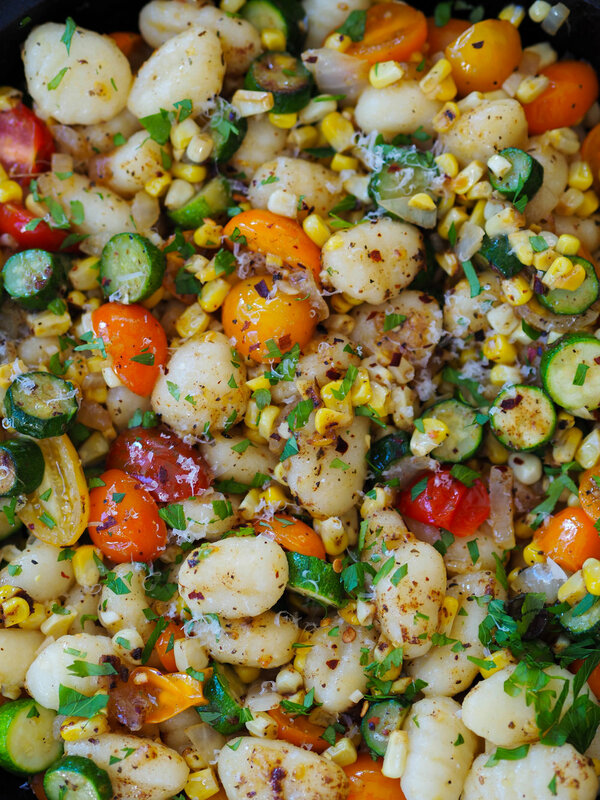 This gnocchi dish is summer perfection. 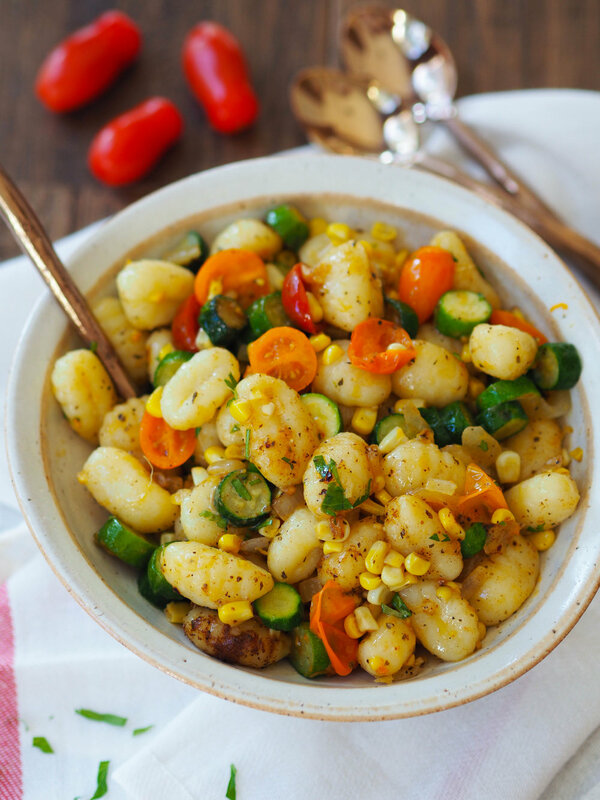 Fluffy gnocchi tossed with sauteed sweet corn, zucchini and juicy cherry tomatoes. And that brown butter sauce y'all...if you haven't, you must. Gnocchi is definitely my favorite pasta. There's something so perfect about those pillowy bites of goodness. It's on my bucket list to learn how to make perfect gnocchi from scratch. 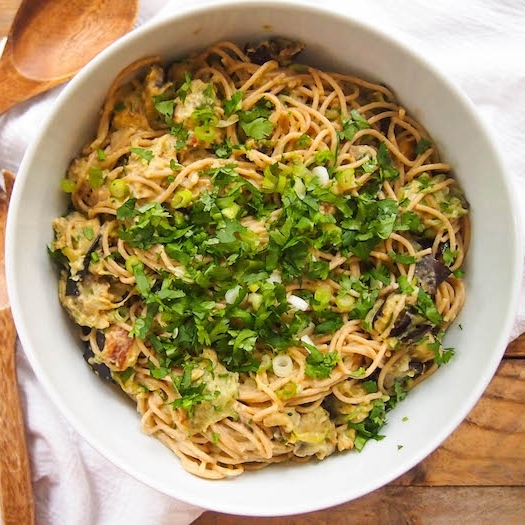 I've tried a few times, even whipping up a gluten free version that was pretty darn tasty. I've found ricotta gnocchi is pretty fail-proof. But perfect potato gnocchi has eluded me. So store bought it is for the forseeable future. And that's fine. I'll enjoy perfect gnocchi when I go out to eat. Columbia friends, any recommendations for really yummy homemade gnocchi in town? I do have two complaints about store bought gnocchi though. First, is it just me, or do you guys always burn yourself trying to drop gnocchi into boiling water? My husband is a food packaging engineer (yes, that's a real thing) and I'm going to start harassing him to fix this one. Second, I feel like gnocchi packages need, like, 25-50% more to make enough to serve four. One pack is always enough for three satisfying main dish servings, but that means the hubs and I are fighting it out over who gets leftovers. So I guess the moral of this story is that my husband better get on that gnocchi packaging if he wants to save our marriage. The brown butter is definitely the star of this dish though. Have you ever tried it before? Slowly browning the butter in a skillet gives it this incredible nutty flavor. I know, it's hard to imagine butter getting more delicious, but brown butter proves it's possible. Just watch it closely as you're browning it because burnt butter is not so tasty. Heat olive oil in a large skillet on medium-high heat. Add zucchini, corn, onion, and a pinch of salt and saute 5-7 minutes until onion is translucent and zucchini is crisp-tender. Add cherry tomatoes, garlic, and red pepper flakes and saute until vegetables are lightly browned and tender. Season with salt and black pepper to taste. While vegetables are cooking, bring a large pot of salted water to a boil and cook gnocchi to package directions. 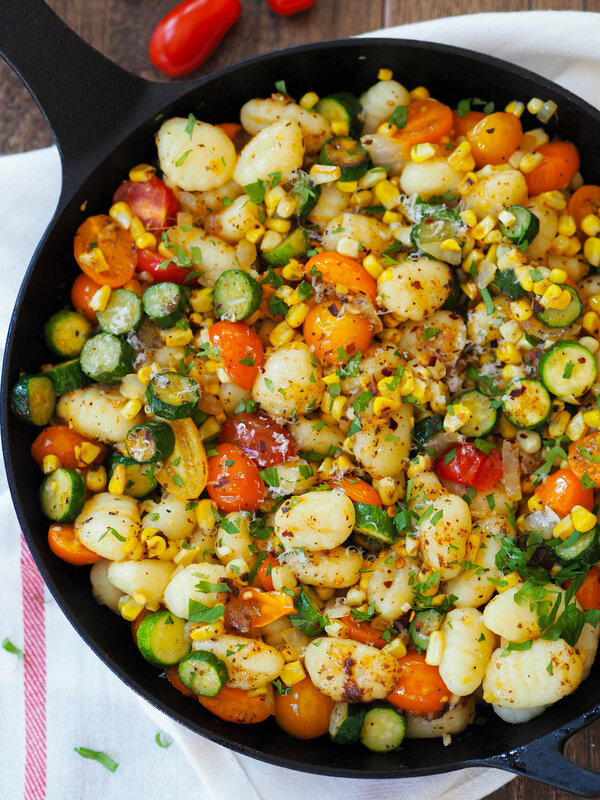 Drain and add to skillet with the vegetables. Make the brown butter. Heat butter and basil in a skillet (preferably with a light color so you can see how the butter is browning) on low heat. Cook until melted. Continue to cook as butter spatters, then eventually starts to foam, stirring regularly to scrape up the bottom and prevent burning. Cook until milk solids are golden brown, about 7 minutes total. Here's a link with pictures if you're not sure. Scrape butter over the pasta and toss to combine. Serve garnished with parmesan.